The public defence of my PhD thesis took place at AHO, December 22. 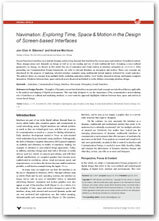 The thesis, entitled Navimation: a sociocultural exploration of kinetic interface design is now available online, through AHO’s open access archive ADORA. The thesis consists of a metareflection (kappe) and three publications. All publications have gone through peer-review and have been published before. The metareflection situates and extends these publications by providing more theoretical background and introducing new concepts and models. Eikenes, J.O.(2010). 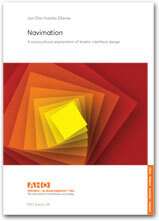 Navimation: a sociocultural exploration of kinetic interface design. 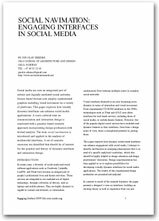 Doctoral thesis, Oslo School of Architecture and Design, Institute of Design, Oslo. Eikenes, J.O. and A. Morrison (2010). Navimation: Exploring time, space & motion in the design of screen-based interfaces. 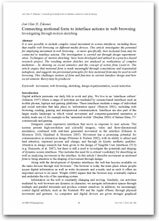 International Journal of Design, 4(1), 1-16. Also available from The International Journal of Design..
Eikenes, J. O. (2009). Social navimation: Engaging interfaces in social media. Paper presented at Engaging Artifacts. The 3rd Nordic design research conference (NORDES). 31 August-1 September. Eikenes, J.O.(2010). Connecting motional form to interface actions in web browsing: Investigating through motion sketching. FORMakademisk, 3(1), 80-100. Also available from FORMakademisk. I have also created an online version with embedded videos.